Programming note: We’re going to shift to a once-a-month schedule for blog posts because I just don’t have enough good material right now to keep up weekly posts. The best way to make sure you see them is to sign up to get the posts by email via FeedBlitz. The sign-up box is in the lower right-hand corner of the web pages (“Stay updated on our animals”). New schedule will be the first Monday of the month. That’s Tanner above on the day we opened the big box of presents over the holidays. 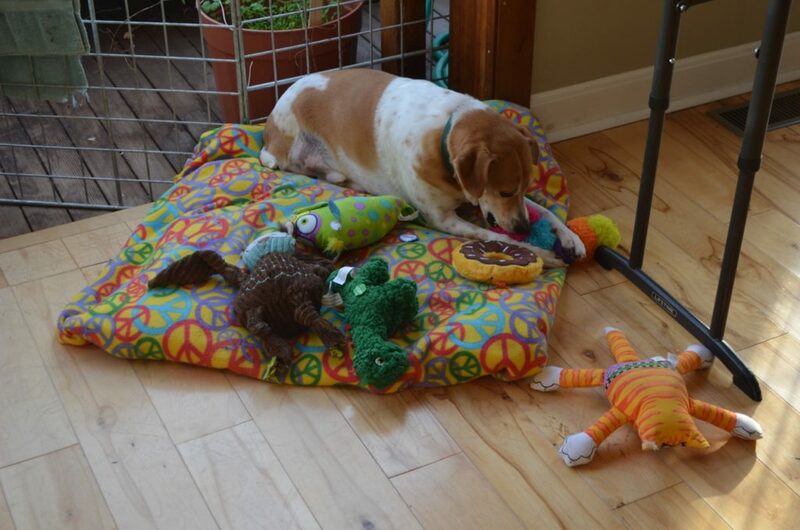 He is always collecting toys around himself — you can never have too many! — and then running off to find a new one to bring back. With a boxful of new toys that morning, he was having the time of his life adding to his collection. Tanner will chew like mad on a toy for a few minutes, grow bored, and search for another one. He also likes to take new toys outside and then drop them into the snow by the spruce tree at the other end of the yard, not to be seen again until spring. He’ll stand at the front door, toy in mouth, waiting to be let out. Alayne will say to him in a firm voice, “You are NOT taking that toy outside, young man!” and he will dutifully, if reluctantly, drop it before she opens the door for him. Do you see that metal panel behind Tanner in the solarium? Well, last spring Tanner discovered he could jump up into the raised beds and run back and forth across them, all to get a better, more elevated, view of whoever had driven up to the house. I looked over one morning from outside and saw him trampling the lettuce in the beds and was beside myself. So the panels across the openings into the solarium put an abrupt end to that little adventure! Awwww, I understand the blog post cut back but will miss the weekly updates. If anything momentous comes up please, if possible, send an update. Tanner is quite the character. After the snow melts it will be Christmas all over again. I still think Tanner is my favorite! Love that little guy, so does Cliff. Every tie I get an email from Rolling Dog Farm I know my day is going to be uplifted tenfold. Dear Sweet Tanner. Tanner is so funny! I have one, Diego, who will take his chew bones and drop them outside. When he does this I tell him….Go pick up your toys…..and he’ll pick up each one and take it inside. Love all the furbabies…each one is special. Tanner’s such a character! I can sympathize with your consternation over the lettuce beds. Dogs are always coming up with new ways to keep everyone’s life interesting! Can you occasionally post pictures even if you don’t write a blog. I love pictures!! Thanks. Any news is great news on the dogs; the farm; you two; etc. This is a precious photo of Tanner, surrounded by his “friends”. I have a blind kitty who does the exact same thing. Occasionally, I see her sitting in the middle of them all sound asleep. I hope these bring him as much comfort and joy.